Susan Therriault directs the College and Career Readiness and Success Comprehensive Center (Center) at the American Institutes for Research. For over 18 years, Dr. Therriault has led and conducted research that focuses on state and federal education efforts to build the capacity of high-needs districts and schools aiming to prepare students for college and career. As a researcher, Dr. Therriault’s expertise is examining the state and district roles in supporting and turning around low performing schools. She has substantial experience providing technical assistance and conducting research on secondary schools and strategies to support students’ transition between middle and high schools and high school and postsecondary education and careers. The studies include the examination of state level strategies to improve high schools, funded by the Bill and Melinda Gate Foundation, the Institute for Education Sciences study of Title I, 1003(g) School Improvement Grant implementation, as well as state-level efforts in Massachusetts, Michigan and Virginia focused on supporting state, district and school level development and implementation of early warning systems to improve student graduation rates and college readiness. She has been a featured guest expert on improving student outcomes in high school on National Public Radio’s Marketplace, Minnesota public television and public radio, and Wisconsin public television. 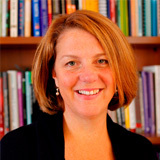 Dr. Therriault holds a master of education and a doctor of education in education policy and leadership from the University of Massachusetts Amherst. She served for six years as a member-at-large of the Massachusetts School and District Accountability and Support Advisory Board and for seven years as a member of her local school board. She is currently on the advisory board of the Massachusetts Condition of Education board, convened by the Rennie Center.